A few weeks ago I made a pilgrimage to the Columbia River to pay my respects to the king of spring. Not to be confused with those porcini mushrooms also called "spring kings," Columbia River spring Chinook—or springers—are some of the first returning among the Pacific salmon, and many piscivores consider them the best tasting of all the many races and runs of salmon. Taste is largely subjective, sure, but there's science behind this conceit. Salmon spawn in the fall and early winter. Because springers enter fresh water so early and must hold on for months before spawning—without eating—these particular fish have evolved to be especially fatty. They survive on their impressive fat stores, and we all know that fat means flavor, right? 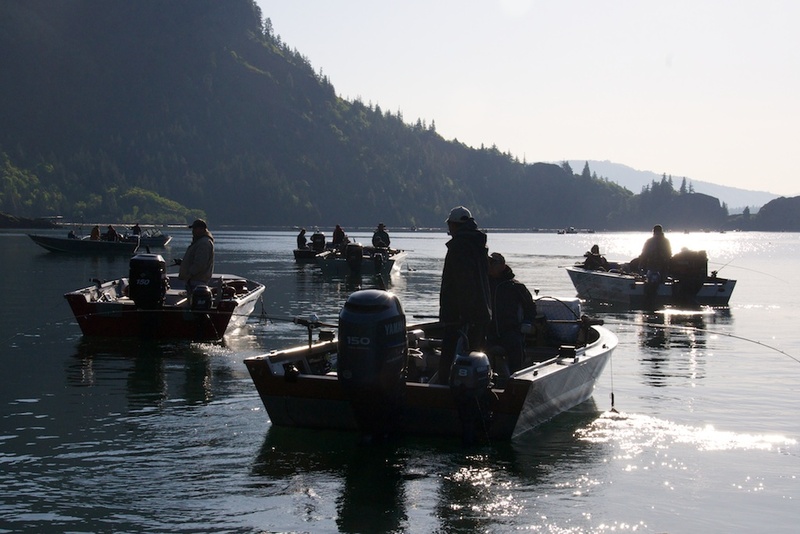 The Columbia River spring Chinook fishery is limited and tightly regulated. 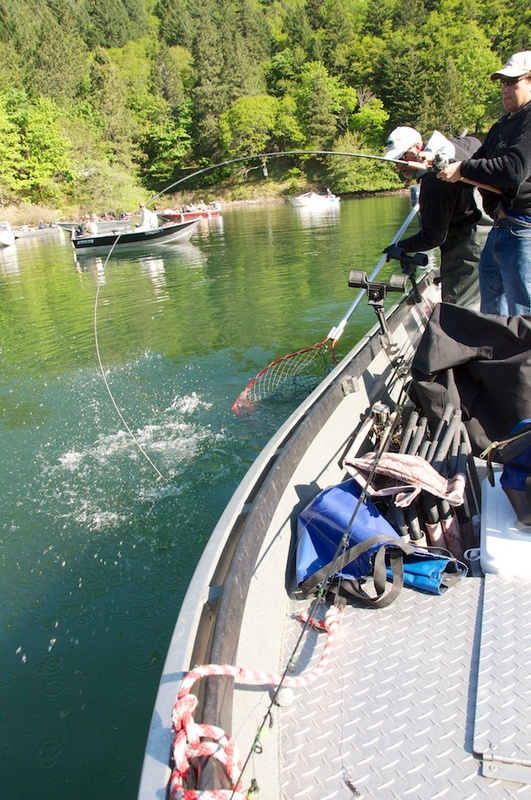 Anglers can fish the main stem in a few spots as well as tributaries such as the Willamette and Cowlitz. We fished Drano Lake, one of the better known hot spots for springers. 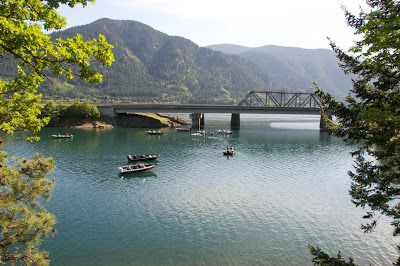 Drano is a manmade lake created by the fill left over from the construction of Bonneville Dam. 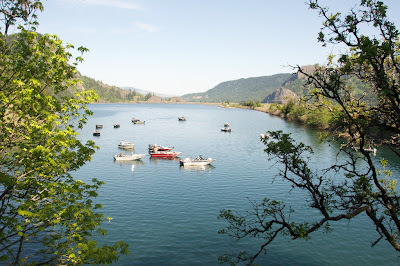 The Little White Salmon River flows into the lake, making it noticeably colder than the mainstem river, so salmon and steelhead nose into it during their upstream migrations for a refreshing breather. 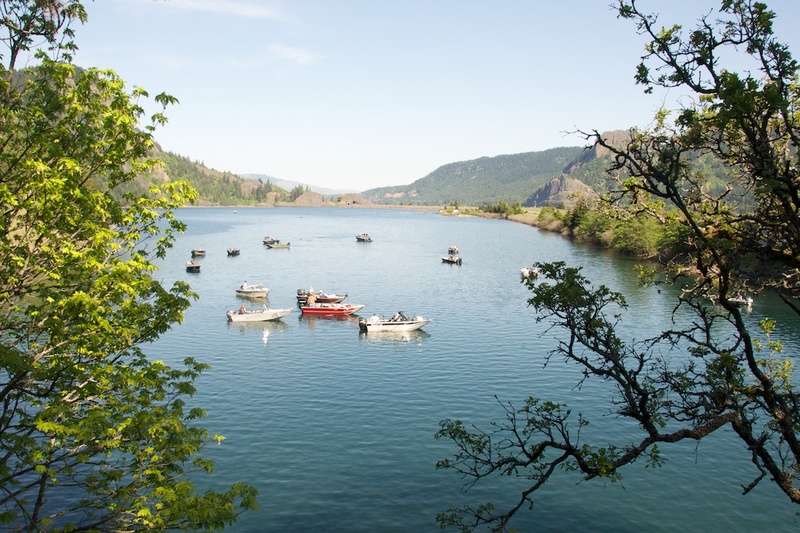 The bulk of the fishery is at the lake's outlet, near a railroad trestle and highway 14 bridge. We got on the water around 5:15 a.m.—and we weren't alone. 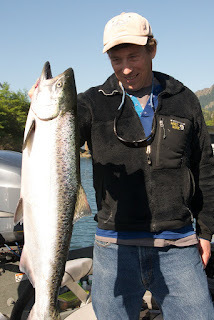 The spring king fishery attracts plenty of early risers hoping to put a slab of deep red salmon fillet on the barbecue. Slowly we trolled across the placid waters of Drano Lake, pulling plugs. By 6:30 it was clear that the bite was not on in the lake, so we joined the "toilet bowl" of boats circling the outlet channel where salmon are forced into a narrow channel as they enter and leave the lake. We switched to bait: cured shrimp and herring, fished at a depth of about 24 feet to avoid snags on the bottom. Though salmon don't actively feed once on the spawning grounds, they can still be provoked to strike at a bait or lure—whether out of territoriality or some memory of their predatory oceanic life, no one really knows. We settled into the somnolent rhythm of the counter-clock "toilet bowl" slow-dance. The first hit, at noon, startled me out of my seat. I grabbed the rod and tried to keep the fish away from the other boats. It took line at will. When we had it close to the boat the nerve-wracking moment commenced (we saw more than one lost at the boat during the day). The king got a look and spooked. It ran under the boat and I had to fight it in close with a distressingly bowed rod tip. A couple more short runs and we got it sideways and in the net. Phil at Mystical Legends provided excellent guiding. Though it was a slow day overall, we got another strike a few hours later and boated that fish too, going two for two, which isn't a bad hook-to-land ratio when it comes to spring kings. Back home, the first taste was simple, as it should be, to allow the salmon to shine: grilled with a little olive oil and a light sprinkle of salt and pepper. With a fish of this caliber you want to savor every last shred of meat from nose to tail. In my next post I'll have a recipe for Salmon Head Curry that will have you second-guessing your choice of crab bait.